It looks like Chevrolet is all determined to design the future of automotive industry. 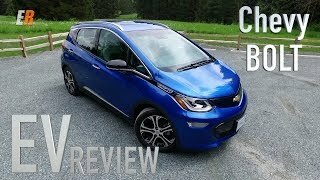 At the 2016 Consumer Electronics Show they once again proved this by unwrapping the Chevrolet Bolt EV 2017. The model features cutting edge technology and will take you 200 miles per charge. To be mentioned that the model is the production version of the concept we saw at the 2015 Detroit Auto Show. 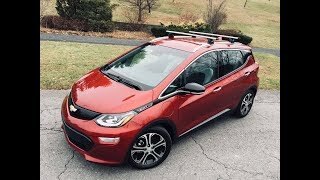 Let us have a look at the review of Chevrolet Bolt EV 2017 to know in detail about it. The interior of Chevrolet Bolt EV 2017 is somewhere behind to what we see in the concept. However it still isn’t a dull work. Inside you’ll notice the blue ambient lighting with metallic white trim that gets complemented with the floating dashboard design. The steering wheel and pedals might recall some space movie due to its design. The instrument cluster looks gorgeous with the blue lighting. The same essence also carries to the center console while the outlined seats look very comfortable. The latter gets connected with the central tunnel that has some extra space. Apart from these there is lots of space inside for the passengers and the cargo, measuring 94.4 cubic feet and 56.6 (front)/16.9 (rear) respectively. Getting to the tech features, model comes integrated with the Bluetooth Smartphone connectivity and can keep upto 10 devices in its list. The integration additionally gets the feature to recognize the listed devices and will on its own get attached to them as they’ll come in range. Buyers will also get MyChevrolet App, 4G LTE Wi-Fi hotspot and Apple CarPlay with Android Auto as standard. 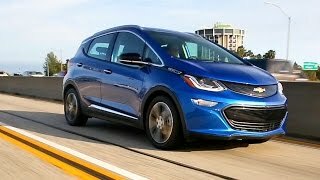 Thus rounding up the interior details of Chevrolet Bolt EV 2017 I’ll call the model a lap ahead of those in its competition. 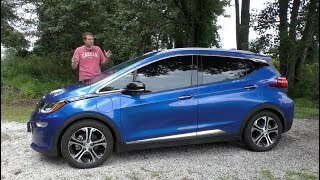 The exterior of Chevrolet Bolt EV 2017 unlike its interior keeps the essence of the concept version. Starting with the front fascia it has the traditional grille getting flanked by LED headlights on either sides. You can notice the black outlining adding to the gleam. It starts with the edge of the hood, moving through rear view mirrors, passing through window panes till the rear end. Beneath the headlights we have set of fog lamps placed at the same place as that in the concept. Around back you can notice minor changes; this includes the taillights and the spiky, floating roof. Apart from this for the exterior of Chevrolet Bolt EV 2017, everything remains same as in the production version. 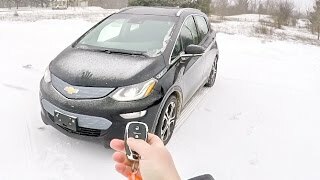 As of now there is no word regarding the drivetrain of Chevrolet Bolt EV 2017 but we do know that the four-wheel-drive model will be capable of driving 200 miles after single charge. Other performance figures of Chevrolet Bolt EV 2017 are expected to be out by the next release.